Charlie Christian (Charles Henry Christian, Bonham, Texas, 29 July 1916 ? New York City, 2 March 1942) was an American swing and jazz guitarist. Christian was an important early performer on the electric guitar, and is cited as a key figure in the development of bebop and cool jazz. He gained national exposure as a member of the Benny Goodman Sextet and Orchestra from August 1939 to June 1941. His single string technique combined with amplification helped bring the guitar out of the rhythm section and into the forefront as a solo instrument. Christian was an important early performer on the electric guitar, and is cited as a key figure in the development of bebop and cool jazz. He gained national exposure as a member of the Benny Goodman Sextet and Orchestra from August 1939 to June 1941. His single string technique combined with amplification helped bring the guitar out of the rhythm section and into the forefront as a solo instrument. John Hammond and George T. Simon called Christian the best improvisational talent of the Swing Era. In the liner notes to the 1972 Columbia album Solo Flight: The Genius of Charlie Christian, Gene Lees writes that "many critics and musicians consider that Christian was one of the founding fathers of bebop, or if not that, at least a precursor to it." Christian's influence reached beyond jazz and swing, and in 1990 Christian was inducted into the Rock and Roll Hall of Fame. In 2006, the City of Oklahoma City, Oklahoma renamed a street in its Bricktown entertainment district "Charlie Christian Avenue." Oklahoma City is also the home of an annual jazz festival named for Christian. Christian was born in Bonham, Texas, but his family moved to Oklahoma City, Oklahoma, when he was a small child. Both of his parents were musicians and he had two brothers, Edward, born 1906, and Clarence, born 1911. All three sons were taught music by their father, Clarence Henry Christian. Clarence Henry was struck blind by fever, and in order to support the family he and the boys would work as buskers, on what the Christians called "busts." He would have them lead him into the better neighborhoods where they would perform for cash or goods. When Charles was old enough to go along he first entertained by dancing. Later he learned guitar, inheriting his father's instruments upon his death when Charles was 12. He attended Douglass School in Oklahoma City, and was further encouraged in music by instructor Zelia Breaux. Charles wanted to play tenor saxophone in the school band, but she insisted he try trumpet instead. Because he believed playing the trumpet would disfigure his lip, he quit to pursue his interest in baseball, at which he excelled. 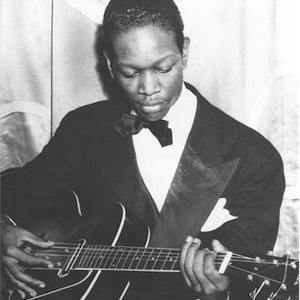 In a 1978 interview with Charlie Christian biographer Craig McKinney, Clarence Christian said that in the 1920s and 30s Edward Christian led a band in Oklahoma City as a pianist and had a shaky relationship with trumpeter James Simpson. After a rivalry with a certain girl, Simpson had the urge to get even with the egotistical Christian. Around 1931, he took guitarist "Bigfoot" Ralph Hamilton and began secretly schooling the younger Charles on jazz. They taught him to solo on three songs, "Rose Room," "Tea for Two," and "Sweet Georgia Brown." When the time was right they took him out to one of the many after-hours jam sessions along "Deep Deuce," Northeast Second Street in Oklahoma City. "Let Charles play one," they told Edward. "Ah, nobody wants to hear them old blues," Edward replied. After some encouragement, he allowed Charles to play. "What do you want to play?" he asked. All three of the songs were big in the early 1930s and Edward was surprised that Charles knew them. After two encores, Charles had played all three and "Deep Deuce" was in an uproar. He coolly dismissed himself from the jam session, and his mother had heard about it before he got home. Charles soon was performing locally and on the road throughout the Midwest, as far away as North Dakota and Minnesota. By 1936, he was playing electric guitar and had become a regional attraction, and jammed with many of the big name performers traveling through Oklahoma City, among them Teddy Wilson and Art Tatum. It was Mary Lou Williams, pianist for Andy Kirk and His Clouds of Joy, who told John Hammond about him. He auditioned for record producer John Hammond, who recommended Christian to bandleader Benny Goodman. Goodman was the first white bandleader to feature black musicians ? he hired Fletcher Henderson as arranger and Teddy Wilson on piano in 1935, and in 1936 added Lionel Hampton on vibraphone. Goodman hired Christian to play with the newly formed Goodman Sextet in 1939. It has been often stated that Goodman was initially uninterested in hiring Christian because electric guitar was a relatively new instrument. Goodman had been exposed to the instrument with Floyd Smith and Leonard Ware among others, none of whom had the ability of Charlie Christian. There is a report of Goodman unsuccessfully trying to buy out Floyd Smith's contract from Andy Kirk. However, Goodman was so impressed by Christian's playing that he hired him instead. There are several versions of the first meeting of Christian and Goodman on August 16, 1939. Suffice to say the encounter that afternoon at the recording studio had not gone well. Charles recalled in a 1940 Metronome magazine article, "I guess neither one of us liked what I played," but Hammond decided to try again ? without consulting Goodman (Christian says Goodman invited him to the show that evening), he installed Christian on the bandstand for that night's set at the Victor Hugo restaurant in Los Angeles. Displeased at the surprise, Goodman called "Rose Room", a tune he assumed that Christian would be unfamiliar with. Unknown to Goodman, Charles had been reared on the tune, and he came in with his solo ? which was to be the first of about twenty, all of them different, all unlike anything Goodman had heard before. That version of "Rose Room" lasted forty minutes; by its end, Christian was in the band. In the course of a few days, Christian went from making $2.50 a night to making $150 a week. By February 1940, Christian dominated the jazz and swing guitar polls and was elected to the Metronome All Stars. In the spring of 1940, Goodman let most of his entourage go in a reorganization move. He made sure to retain Charlie Christian, and in the fall of that year Goodman led a Sextet with Charlie Christian, Count Basie, longtime Duke Ellington trumpeter Cootie Williams, former Artie Shaw tenor saxophonist Georgie Auld and later drummer Dave Tough, an all-star band that dominated the jazz polls in 1941, including another election to the Metronome All Stars for Christian. Christian's solos are frequently referred to as "horn-like", and in that sense he was more influenced by horn players such as Lester Young and Herschel Evans than by early acoustic guitarists like Eddie Lang and jazz/bluesman Lonnie Johnson, although they both had contributed to the expansion of the guitar's role from "rhythm section" instrument to a solo instrument. Christian admitted he wanted his guitar to sound like a tenor saxophone. Belgian gypsy jazz guitarist Django Reinhardt had little influence on Christian, but he was obviously familiar with some of his recordings. Guitarist Mary Osborne recalled hearing him play Django's solo on "St. Louis Blues" note for note, but then following it with his own ideas. By 1939 there had already been electric guitar soloists?Leonard Ware, George Barnes, trombonist/composer ("Topsy") Eddie Durham had recorded with Count Basie's Kansas City Six, Floyd Smith recorded "Floyd's Guitar Blues" with Andy Kirk in March 1939, using an amplified lap steel guitar, and Texas Swing pioneer Eldon Shamblin was using amplified electric guitar with Bob Wills. However, Charles Christian was the first great soloist on the amplified guitar. Guitarists who followed Christian and who were to varying degrees influenced by him include Mary Osborne, Oscar Moore (Nat King Cole trio), Barney Kessel, Herb Ellis, Jimmy Raney, Tal Farlow, and?-a generation later?-Jim Hall. "Tiny" Grimes, who made several records with Art Tatum, can often be heard quoting Christian note-for-note. Christian paved the way for the modern electric guitar sound that was followed by other pioneers, including T-Bone Walker, Les Paul, Grant Green, Kenny Burrell, Wes Montgomery, B.B. King, Chuck Berry and Jimi Hendrix. For this reason Christian was inducted in 1990 into the Rock and Roll Hall of Fame as an "Early Influence." Christian's exposure was so great in the brief period he played with Goodman that he influenced not only guitarists, but other musicians as well. The influence he had on "Dizzy" Gillespie, Charlie Parker, Thelonious Monk and Don Byas can be heard on their early "bop" recordings "Blue'n Boogie" and "Salt Peanuts." Other musicians, such as trumpeter Miles Davis, cite Christian as an early influence. Indeed, Christian's "new" sound influenced jazz as a whole. He reigned supreme in the jazz guitar polls up to two years after his death. Thelonious Monk, who played with Charlie Christian at Minton's Playhouse, developed a style similar to his.Charlie Christian was an important contributor to the music that became known as "bop" or "Bebop." Private recordings made in September 1939 in Minneapolis, Minnesota by Goodman aficionado Jerry Newhouse capture the newly hired Christian while on the road with Goodman and feature Goodman tenor sax man Jerry Jerome and then local bass man Oscar Pettiford. Taking multiple solos, Christian shows much the same improvisational skills later captured on the Minton's and Monroe's recordings in 1941, suggesting that he had already matured as a musician. The Minneapolis recordings include Stardust, Tea For Two and I've Got Rhythm, the latter a favorite piece of bop composers and jammers. More of the unrestrained Christian is apparent in recordings of the partial Goodman Sextet made in March 1941. With Goodman and bassist Artie Bernstein absent, Christian and the rest of the Sextet recorded for nearly 20 minutes as the engineers tested equipment. Two recordings were released from that session years later: "Blues in B" and "Waiting for Benny", which showed hints of bop jam sessions. The free flow of these sessions contrasts with the more formal swing music recorded after Goodman had arrived at the studio. Other Goodman Sextet records that foretell bop are "Seven Come Eleven" (1939) and "Air Mail Special" (1940 and 1941). An even more striking example is a series of recordings made at Minton's Playhouse, an after hours club located in the Hotel Cecil at 210 West 118th Street in Harlem by Columbia student Jerry Newman on a portable disk recorder in 1941. Newman captured Christian, accompanied by Joe Guy on trumpet, Kenny Kersey on piano and Kenny Clarke on drums, stretching out far beyond what the confines of the 78 RPM record would allow. His work on "Swing to Bop", a later Esoteric Records company re-title of Eddie Durham's "Topsy," is an example of what Christian was capable of creating "off the cuff." His use of tension and release, a technique employed by Lester Young, Count Basie and later bop musicians, is also present on "Stompin' at the Savoy", included among the Newman recordings. The collection also includes recordings made at Clark Monroe's Uptown House, another late-night jazz haunt in the Harlem of 1941 that include Oran "Hot Lips" Page. Other recordings include tenor sax man Don Byas. The Minton's recordings were long rumored to feature "Dizzy" Gillespie and Thelonious Monk, but that has since been proven untrue, although both were regulars at the jam sessions, with Monk a regular in the Minton's house band. Kenny Clarke claimed that "Epistrophy" and "Rhythm-a-ning" were Charlie Christian compositions that Christian played with Clarke and Thelonious Monk at Minton's jam sessions. The "Rhythm-a-ning" line can be heard on "Down on Teddy's Hill" and behind the introduction on "Guy's Got To Go" from the Newman recordings, but it is also a line from Mary Lou Williams' "Walkin' and Swingin'." Clarke said Christian first showed him the chords to "Epistrophy" on a ukulele. These recordings have been packaged under a number of different titles, including "After Hours" and "The Immortal Charlie Christian." While the recording quality of these sessions is poor, they show Christian stretching out much longer than he could on the Benny Goodman sides. On the Minton's and Monroe's recordings, Christian can be heard taking multiple choruses on a single tune, playing long stretches of melodic ideas with ease. His use of eighth note passages, triplets and arpeggio are evidence of his contribution to modern jazz. Christian was just as adept with understatement as well. His work on the Goodman sextet sides "Soft Winds," "Till Tom Special," and "A Smo-o-o-oth One" show his use of very few, well placed melodic notes. His work on the Sextet's recordings of ballads "Stardust" , "Poor Butterfly" , "I Surrender Dear" and "On the Alamo" as well as his work on "Profoundly Blue" with the Edmond Hall Celeste Quartet (1941) show hints of what was later to be called "cool jazz." Although credited for very few, Christian composed many of the original tunes recorded by the Benny Goodman Sextet. There were many reports of Charlie staying out late at jam sessions and eating poorly. He was not known to be a drug addict, but reportedly did use marijuana and alcohol. Further, in the late 1930s Christian had contracted tuberculosis and in early 1940 was hospitalized for a short period in which the Goodman group was on hiatus due to Benny's back trouble. Goodman was hospitalized in the summer of 1940 after the band's brief stay at Santa Catalina Island, California, where the group stayed when on the west coast. Christian returned home to Oklahoma City, in late July 1940 before returning to New York City in September 1940. In early 1941, Christian resumed his hectic lifestyle, heading to Harlem for late-night jam sessions after finishing gigs with the Goodman Sextet and Orchestra in New York City. In June 1941 he was admitted to Seaview, a sanitarium on Staten Island in New York City. He was reported to be making progress, and Down Beat magazine reported in February 1942 that he and Cootie Williams were starting a band. After a visit that same month to the hospital by tap dancer and drummer Marion Joseph "Taps" Miller, Christian declined in health and died March 2, 1942. He was buried in an unmarked grave in Bonham, Texas, and a Texas State Historical Marker and headstone were placed in Gates Hill Cemetery in 1994. Charles fathered a daughter, Billie Jean Christian, born 23 December, 1932, with Margretta Lorraine Downey of Oklahoma City, Oklahoma. They never married. Billie Jean (Christian) Johnson died 19 July 2004. In 1966, 24 years after his death, Christian was inducted into the Down Beat Jazz Hall of Fame.